I found Eating Royally to be an interesting mix of personal memories and great recipes. 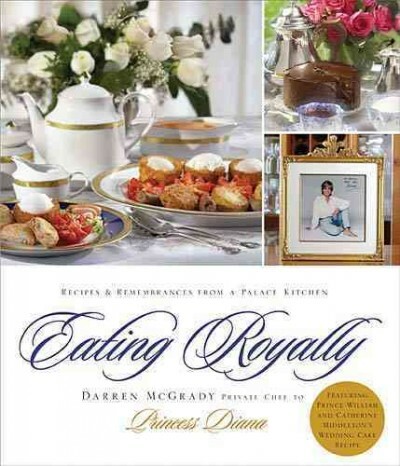 Chef Darren McGrady—who was the Royal Chef to Queen Elizabeth II, Princess Diana, Prince William, and Prince Harry for 15 years—gives us a glimpse into the private world of the royal family, along with sharing recipes for some of their favorite dishes. He includes interesting photographs, memorabilia, personal notes, and lots of anecdotal stories about the royal household. The stories are told with lighthearted humor and warmth. Chef McGrady obviously thoroughly enjoyed working with the royal family, and there was a mutual respect between them. Unlike others, he did not write about them to profit personally— in fact he gives 100% of the profits to Princess Diana’s charity. Eating Royally is a great way to get an insider’s glimpse of how royals really live their day-to-day lives when they are out of the spotlight, and to taste the very same dishes that have graced the tables of Buckingham Palace, Windsor, and Balmoral. After all, wouldn’t you like to have your very own slice of Her Majesty’s Birthday Chocolate Cake? I know I would. The last of my trio of films set in the industrial north of England is Brassed Off! This is a very emotional movie set ten years after the Miner’s Strike of 1984 (featured in Billy Elliot). The mining industry is being systematically dismantled by the Thatcher government and now Grimley, a profitable mine, is threatened with closure. To appreciate this movie you have to understand mining communities – close knit and totally dependent on the colliery for their livelihoods. Most pits have a brass band which is so much more than just a band – it is a symbol of the pride and dignity of the miners. I remember my dad taking me to the annual Durham Big Meeting, which was a parade of colliery bands through the streets of Durham – each band preceded by a huge banner held high – often draped with a black scarf to symbolize recent fatalities. Each time I went to the Big Meeting there were fewer and fewer bands participating – strongly symbolic of the decline of the mining industry. But still the bands marched on with pride and passion – an image that I remember vividly to this day. But I digress. At the heart of Brassed Off! is Danny (brilliantly played by Pete Postlethwaite) the leader of the Grimley Colliery Brass Band. His determination to keep the band together come what may, and his passion for the music energizes the other members – keeping them practicing when they would otherwise have given up. The band gives them all a focus – something to strive towards in the face of adversity. A love of colliery brass band music will enhance your enjoyment of this film, but even if you’re not a fan, I challenge you to remain dry-eyed through the passionate rendering of Danny Boy – you might even develop a liking for this powerfully emotional music – give it a try. Another film from the economically depressed north of England (where I grew up many years ago) is a story focusing on the inner conflicts and struggles of young Billy Elliot during the Miner’s Strike of 1984 – an event described by some as the most defining moment in British history since World War II. In stark contrast to everything around him, Billy Elliot finds self-expression and fulfillment through the grace and poise of ballet. While his dad thinks that he’s learning life skills in boxing class, Billy is secretly donning his ballet slippers and perfecting his pirouette with the girls. When his family finds out they are furious, but Billy is determined to continue what has now become a passion. His anger and frustration build up and burst onto the screen in a terrific dance scene set to A Town Called Malice by Jam. The movie is beautifully filmed – making much use of long shots to compress the image creating a sense of close community. The soundtrack features T. Rex, but as you might expect, Fred Astaire sneaks in too. The acting is superb, not only from the supporting cast including Gary Lewis as Billy’s dad, and Julie Walters (Shirley Valentine) as his ballet teacher, but also an amazing first performance from the 13 year old Jamie Bell who holds the film together as Billy Elliot. Certainly a movie well worth watching. Can you imagine a worse twist of fate than winning big on the lottery only to drop dead with the shock? Well that’s what happens to Ned Devine. Ned’s untimely demise doesn’t stop his neighbors from trying to make sure that Ned’s good fortune is not wasted. They hatch up a simple plan to claim the money and share it amongst all the villagers in Tully More all 52 of them. Set in a picturesque Irish village, Waking Ned Devine is a charming rural comedy. Although not exactly an action-packed movie, (unless you include the naked dash on a motor bike – an absolute gem! ), there is enough of a plot to hold the viewer’s interest. The strength of the movie is in the subtle Irish comedy. Waking Ned Devine is a gently funny movie – most of the humor derives from a clever and witty dialogue between its cast of eccentric characters – a great example is the opening scene involving a piece of apple tart!! Waking Ned Devine gives us a glimpse of everyday village life in rural Ireland – where your business is everyone’s business, there are few secrets, and there’s little to do with your money other than spend it at the local pub. It reminds us that the smaller the community, the more dependent everyone is on each other, and that having lots of money isn’t the most important thing in life. The scenery is idyllic (although not Irish – the film was actually shot on the Isle of Man), and the original score by Shaun Davey reflects the setting of the movie – a real treat for lovers of Irish music. If there’s only one thing you remember after watching this feel-good, lighthearted Irish film, it will probably be this: if you have an important phone call to make, don’t use a public phone booth!! A movie about six unemployed steel workers, set in the depressed industrial north of England, doesn’t exactly sound like the recipe for a successful comedy but believe me, The Full Monty is a terrific film. It is British independent film making at its best. Driven by a desperate need for cash, and inspired by a local performance of the male “dance” show Chippendales, Gaz (Robert Carlyle) comes up with a plan – surely he and his mates can make a few quid by taking off their clothes for the ladies? Just one problem – there is not a good physical specimen amongst them! Indeed, as their old boss Gerald is keen to point out to Gaz and one of his mates – “he’s fat, you’re thin, and you’re both ****** ugly”. Despite their physical shortcomings and their total lack of skills on the dance floor, the group agrees to go “the full monty” – or to strip totally naked – in order to attract the largest possible audience and earn the most cash. Along the way to their one-night only performance, there are some hilarious scenes – my favorite is the impromptu dance in the queue at the unemployment office – but there are also some more serious notes. The film deals with the importance of work to self-esteem, the despair and hopelessness of industrial decline, and the lengths some will go to to hide their situation. But these more serious themes only add to our sympathy for the characters, and don’t hinder the progress of a very entertaining and comical storyline. The humor is down to earth and full of colorful language (not exactly Jeeves and Wooster stuff), but if you don’t mind a good dose of swearing and some challenging accents, you will enjoy a hilarious and poignant view of British life. The sound track is jolly good too – a great mix of seventies dance tunes to tap your feet to!